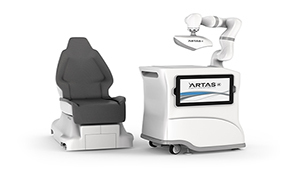 Restoration Robotics, the global leader in robotic hair restoration, today announced the third class in its continuing education Master Class Series for the ARTAS® Robotic Hair Restoration System. The Master Class Series trains physicians on best practices and the most up-to-date techniques for male aesthetic patients on our cutting-edge technology. The ARTAS® Hair Transplant System is the first and only robotic system in the world designed to aid surgeons in hair restoration procedures. The Master Class will be led by Dr. Ken Anderson, MD, FISHRS, a double-board certified facial plastic and reconstructive surgeon who focused his practice to the specialty of hair restoration surgery since 2003. He has practiced Follicular Unit Extraction (FUE) since 2003, is in his sixth year of using the ARTAS® system and is an official U.S. Clinical Trainor for the ARTAS® System. Dr. Anderson is the founder and director of the American Academy of Hair Restoration Surgery, which provides advanced training to users of the ARTAS® System in dedicated courses throughout the year. The Master Class includes a live demonstration, hands-on training, and multiple hair restoration topics, such as technical aspects of robotic surgery, overcoming challenges of hairline design, donor and recipient site planning. Ryan Rhodes, President and Chief Executive Officer of Restoration Robotics, said, “Restoration Robotics is committed to the continued investment in physician education through peer-to-peer training on advanced robotic hair restoration techniques. For more information on the ARTAS® iX system, please visit https://artashair.com/ix/. Restoration Robotics, Inc., is a medical device company developing and commercializing the ARTAS Robotic Hair Restoration System. We believe the ARTAS System is the first and only physician-assisted system to dissect, and assist in the harvesting of, follicular units directly from the scalp and create recipient implant sites using proprietary algorithms. The Company has unique expertise in machine vision, image guidance, visual servoing, and robotics, as well as developing intuitive interfaces to manage these technologies.